This fun and frantic event has now been running over the last 45 years, seeing numbers soar from a handful of brave local citizens to over 150 eager individuals travelling from far and wide, desperate to run into the wintery ice-cold waves of the North Sea. Although as you’d expect, you are more likely to see the big numbers witnessing the excitement from the side-lines. 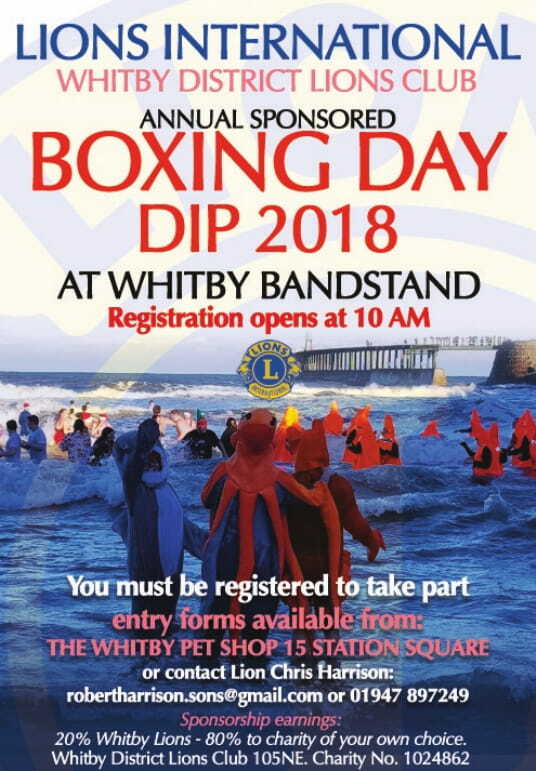 The intention is of course that the Boxing Day Dippers get sponsored, with 80% of funds raised donated to the charity of their choice and the remaining 20% helping many local charities which are supported by Whitby District Lions each year. It is also a great opportunity to raise money for a special charity close to your heart to say thank you for all their efforts and support during the year. The Boxing Day has become a traditional family friendly event with many families meeting up after Christmas Day to spending a lovely Boxing Day morning together. 2017 saw over nearly £10,000.00 raised, with this year hoping to raise even more funds for local causes. The event kicks off at 10am on Boxing Day morning, with registration and fancy-dress judging taking place at the Bandstand, followed by a casual jog into the sea.